Punctuated by gruesome crime-scene tableaux and theatrically framed by its music-hall backdrop, this adaptation (by Jane Goldman) of Peter Ackroyd’s novel unfolds in a suitably grimy 1880’s Victorian London. 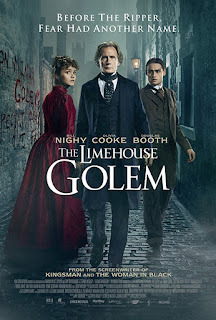 A disparate group of people both rich and poor – a scholar, a prostitute, a whole household – have been slaughtered in colourful ways and city folk come to suspect the mythical “Golem” of the title. Scotland Yard inspector Bill Nighy investigates, his mission to uncover the murderer’s identity running parallel to the race to save Olivia Cooke, suspected of the murder of her husband, from the gallows. “Who knows what any man is capable of…we all wear pantomime masks…” Goldman’s appropriation of the theatrical milieu is hardly subtle but the script cannily includes inventive first-person re-enactments of the murders within the flashback-laden narrative, adding novelty to this visually uncinematic, studio-bound Gothic. Cooke is excellent, as always, while the marvellous Nighy does what he can with a disappointingly underwritten role. It’s an absorbing, well-crafted picture, but it may play better on the small screen, even if its guessable killer is an inescapable flaw in any format.